What you need to know about Liu He, Xi Jinping’s top economic advisor. During his tenure at the State Planning Commission from 1988 to 1998, Liu was involved in making 11 industrial policies. He also participated in the production of four Five-Year Plans (the eighth, ninth, 10th, and 12th Five-Year Plans) and has been one of the major drafters of Party plenum documents since 2003. He was appointed deputy chief of the General Office of the Leading Small Group on Financial and Economic Affairs in March 2003 and was installed as its chief 10 years later. Liu is “very important” because he is considered the general architect of Xi’s economic policies. He is the inventor of the term “dingceng sheji” (“top-level design”), a phrase first used in the 12th Five-Year Plan published in March 2011 to indicate the necessities of making good plans for the coordination of economic, social, and political reforms. 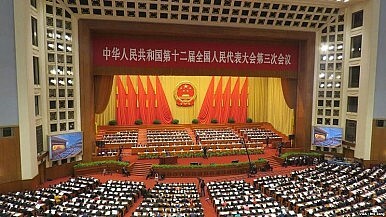 He also introduced another popular term, “dixian siwei” (“bottom-line thinking”), which is also Xi’s favorite. Liu reportedly contributed more than 60 suggestions on economic reforms to the Third Plenum document on comprehensive reforms. According to the old rules, Liu would have to retire in 2017 when he reaches the age of 65. But under Xi’s leadership, Liu not only will not have to retire but also is likely to become one of the decision-makers in the 25-member Politburo. Does China Have a Roadmap to Eliminate Corruption? What's really driving the fight against corruption?